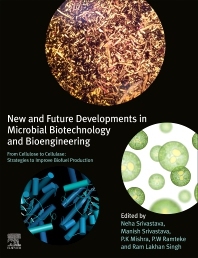 New and Future Developments in Microbial Biotechnology and Bioengineering: From Cellulose to Cellulase: Strategies to Improve Biofuel Production outlines new methods for the industrial production of the cellulose enzyme. The book compares the various processes for the production of biofuels, including the cost of cellulose production and availability. Biofuels are considered to be the main alternatives to fossil fuels in reducing environmental pollution and climate change. Currently, all existing biofuel production is suffering because of the high costs of production processes. As a result, cost effective practical implementation is needed to make this a viable energy alternative. Field of Expertise: Biofuels production, microbial bioprocessing and enzyme technologies Neha Srivastava is currently working as Post-doctorate fellow in Department of Chemical Engineering and Technology, IIT (BHU) Varanasi, India. She has published 23 research articles in the in peer reviewed journals and have 03 patents. She has been completed her PhD from Department of Molecular and Cellular Engineering, SHIATS, India in 2016 in the area of bioenergy. She has been received 06 Young Scientist Awards. Presently, she is working on biofuels production (Cellulase enzymes; production and enhancement, biohydrogen production from waste biomass, bioethanol production). Field of Expertise :Synthesis of nanomaterials and their application as catalyst for development of electrode materials in energy storage, biosensors and biofules productions. Manish Srivastava is working as DST INSPIRE faculty in the Department of Physics and Astrophysics, University of Delhi, India. He has published 39 research articles in the in peer reviewed journals, authored several book chapters and filed 1 patent. He worked as a post doctorate fellow in the Department of BIN Fusion Technology, Chonbuk National University from August 2012 to August 2013. He was an Assistant Professor in the Department of Physics, DIT School of Engineering, Greater Noida, from July 2011 to July 2012. He received his Ph. D. in Physics from the Motilal Nehru National Institute of Technology, Allahabad, India in 2011. Presently, he is working on the synthesis of graphene based metal oxide hybrids and their applications as catalysts. His area of interest is synthesis of nanostsructured materials and their applications as catalyst for development of electrode materials in energy storage, biosensors and biofuels production. Professor P.K Mishra is presently working as the Full time professor and Head, Department of Chemical Engineering and Technology, Indian Institute of Technology (Banaras Hindu University). He has published more than 100 research and review article in national and international journals. He has teaching experience of 20 years. Currently he engaged with the research in the area of Bio-energy namely Bio-butanol and bio-hydrogen, waste water treatment e g bio-remediation, photo-degradation and adsorption, Nano-materials and their applications and recently we also started working in the area of Ultra Filtration and Pervaporation. In addition to these R&D work I take keen interest in the development of good eco-system for Start-ups in the Institute. Personality and entrepreneurship are other areas, where I contribute. Field of expertise: Biofuels production, plant biology, microbial technology Prof. Pramod W. Ramteke is presently Dean of Post Graduate Studies and Heads of Departments of Biological Sciences and Genetics & Plant Breeding at San Higginbottom University of Agriculture, Technology and Sciences (SHUATS), Allahabad, India. He is elected Fellow of National Academy of Agricultural Sciences, National Academy of Biological Sciences, The Linean Society of London, Academy of Microbial Sciences India (AMI), The Biotech Research Society of India, Society for Plant Protection Sciences, Mycological Society of India, Uttar Pradesh Academy of Agricultural Sciences, Maharashtra Academy of Sciences, Association for Biotechnology and Pharmacy, Society of Biological Sciences and Rural Development and The Academy of Environmental Biology. He is recipient of J.C. Bose Gold Medal, SCON Memorial Award for Excellence in Science, Dr. J. C. Edward Medal, Prof. K. S. Bilgramy Memorial Award, Er. V. S. Chauhan Gold Medal, Biotechnology Overseas Associateship and International Fellowship by Biotechnology and Biology Research Council, UK. He is member of editorial board of several journals He has been a visiting Scientist to Hacettepe University, Turkey; Institute of Food Research, UK; University of Liege, Belgium; Korea Institute of Science and Technology, South Korea, University of Szeged, Hungary and Hydrobiological Institute, Czech Republic. In addition to three patents, three books and over 150 research papers are to his credit. He has implemented 7 major projects from DBT, DST, CSIR, UPCAR and CST,UP and supervised 21 PhDs and more than 40 PG Thesis/projects. He was a member of 18th Indian Scientific Expedition to Antarctica (1998-99). Professor Ram Lakhan Singh (h-15) is Dean, Faculty of Science; Professor & Head, Department of Biochemistry and Coordinator, Biotechnology Programme at Dr Ram Manohar Lohia Avadh University, Faizabad, India. He received his Ph.D. from the Indian Institute of Toxicology Research, Lucknow in 1987 awarded on his extensive work on toxicity of synthetic food dyes and their metabolites. Professor Singh joined G.B. Pant University of Agriculture & Technology, Pantnagar, India in 1988 as Assistant Professor of Biochemistry where he taught biochemistry courses to students of Biochemistry, Biotechnology, Microbiology, Agriculture, Home Science and Fisheries. On the research front, he studied the toxicity of pulp and paper mill effluents on plant and animal systems, and also established toxicology laboratory in this University. He joined Dr. Ram Manohar Lohia Avadh University, Faizabad as Associate Professor of Biochemistry in 1994 and became full Professor in 2002. He developed the undergraduate and postgraduate courses in Biochemistry, Environmental Sciences and Biotechnology. Professor Singh guided 24 students for their Ph.D. His main areas of research are Nutraceutical Biochemistry, Environmental Biotechnology and Toxicology. He published 83 research papers in National and International journals and attended various scientific conferences and chaired scientific/technical sessions. Professor Singh edited a book (under process of publication by Springer) and contributed 10 chapters in various books published by International publishers. He is on the panel of experts in academic bodies and selection committees of various universities and funding agencies. Professor Singh delivered a number of invited/expert talks and popular lectures related to environmental biotechnology/nutraceuticals/ toxicology issues on various National and International forums. He is office bearer and life member of several learned societies like, Society of Toxicology (India), Society of Biological Chemists (India), Indian Science Congress Association, Indian Council of Chemists and Association of Food Scientists and Technologists (India). He has been honoured as Best Teacher by International Association of Lions Clubs in 1999. Professor Singh has been awarded IUTOX Senior Fellowship by International Union of Toxicology during XI International Congress of Toxicology at Montreal, Canada in 2007. He was conferred with ‘Shikshak Shree Samman’ by Government of Uttar Pradesh in 2012. Professor Singh has been admitted to the Fellowships of the Society of Toxicology, India in 2011 and Academy of Environmental Biology, India in 2015. Great book with great content. Good book for scientists who worked on SSF.